Friends are great. Friends with surprising, delicious food recommendations are even better. Thankfully, my friend Braden has that covered. When I found myself near his office in Troy around lunchtime recently, I thought I would see if he was interested in grabbing coffee or lunch. He was Johnny on the spot with his reply: "Caribbean buffet is good if you haven't been there." First Choice Caribbean in Troy was what he was referring to. No, I hadn't been there, but it sounded perfect. 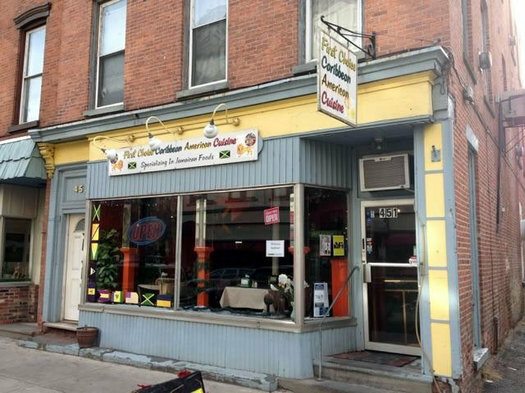 Caribbean cuisine is easily found in the Capital Region (especially Albany), but it never seems to be as known or popular as other ethnic fare. Hot Spot, Kenneth's Taste Bud, Roy's, The Dutch Pot, and Irie Vydez (all in Albany) have been around for a while, but never seem to be places that people jump at the chance to visit (versus, say, a new Korean joint). What a pity. They don't know what they're missing. Braden and I arrived at First Choice Caribbean at noon and we were two of maybe four or five diners there for the buffet. Within fifteen minutes, the place was packed. That doesn't take much since there are probably only 20 or 25 seats in the entire restaurant, but the rush was noticeable. The chef/owner eventually came out from the kitchen to set-up another table for guests. It was feeling a little like a sardine tin in there, but the food was worth it. Within an hour, the entire restaurant had filled and emptied, demonstrating why places like this work for those who know about them: You can eat well, eat a lot, and eat quick and cheap. 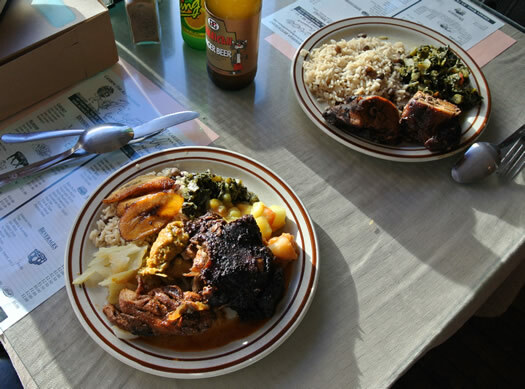 The First Choice Caribbean buffet starts out with rice options traditional of most Latin and Caribbean cuisine -- plain white rice or rice with red beans. From there, build your plate to include a bevy of veg-based dishes, like steamed and vinegar-spiked cabbage, callaloo (a greens-based dish, similar to collards) made with pigeon peas, coconut milk, and allspice; yams and potatoes with a coconut milk sauce; plantains; pumpkin curry; pepperpot; and the chickpea mixture that one would usually find inside a classic Caribbean double (fried dough folded over chickpeas). Meat is next. 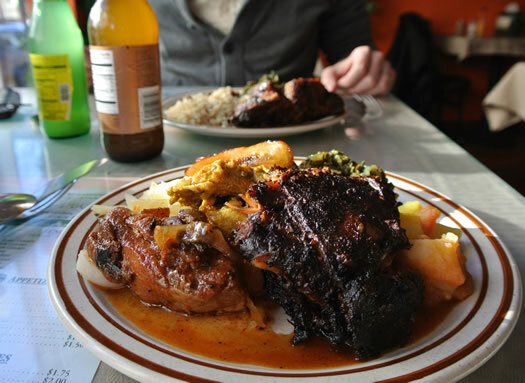 If you go for only one thing here, go for the jerk chicken. Sweet citrus with fiery spice marry together in this charred, crunchy-on-the-outside, tender-in-the-middle poultry dish for which the Caribbean is most famous. Looking around the restaurant, nearly every plate had a heaping portion of jerk chicken. I'd say First Choice makes one of the best versions of it in the region. (Braden said it was spicier than usual the day we dined, so note that if you try it, the spice level might vary. Think of it more as a home-cooked Caribbean meal than a cookie-cutter restaurant option). Chicken stew was also available when we first arrived, and I noticed the chef was constantly working to refresh it. The jerk chicken was my favorite item on the buffet, but I think the chicken stew was most popular among the lunch crowd. Curried chicken rounded out the protein options. Lunch for the two us, including Jamaican pop (I had ginger beer, Braden had grapefruity Ting), ended up being $20 and change, not including a tip. It would be hard to find a better -- or more delicious -- bargain for lunch. With that said, a small staff and fervent lunch rush means that the dishes I delighted in might not always be available if you go. But that's the beauty of these small, ethnic eateries that pepper the Capital Region. They focus on good, wholesome, homestyle, from-scratch food that isn't fussy and is economical. The effort is placed on good food and friendly service. Winter is cold here, but the food at First Choice will give you a taste of sunshine. I know I'll be stopping here often to beat the winter doldrums. I'd argue that the new Korean place (Namu) is worth jumping at the chance to visit because, unlike the other Korean restaurants in the area (not counting Mingle, which falls into a different category), this one is actually really good. I thought First Choice was pretty good when I visited, and I've got to try this buffet one day, but there certainly are other good Caribbean options in the area, which makes it stand out less. I always wondered about their lunch buffet, and if there were enough vegetarian options. And it sounds like they are veggie friendly! Thanks for doing the delicious research. I really love Irie Vybez, but I might have to make a trip to First Choice soon! Gosh that food looks good! Great meal at this joint, for sure. The Jerk Chicken is my favorite, but the Callaloo was a very close second. They make an absolutely delicious Ital stew. I dream about the taste. Great for vegans, vegetarians, and omnivores. Troy is wonderful for lunch in general but this place is my go-to for out of town friends. Glad to see Ricky get some press. 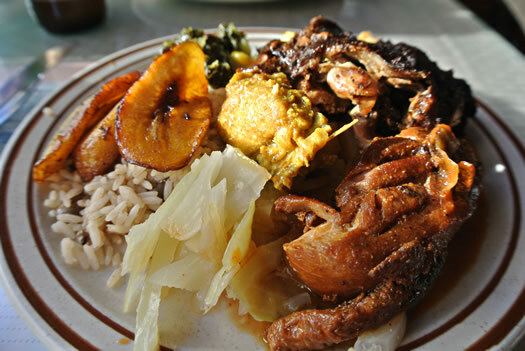 Also, I love the jerk chicken too but honestly, I think the curry chicken is better. For those who don't make it to Troy during the week, they are almost always at the farmer's market on Saturdays.